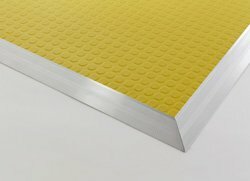 Mayser Safety Mats are tactile sensors which offer maximum protection when safeguarding flat operating areas. Safety or Contact Mats detect persons and objects in dangerous areas of movement. Some examples of use are on machines, robots and transfer routes or on automatically closing doors in buses and trains. Mayser Safety Mats comply with the requirements of the ISO 13856-1 and ISO 13849 standards. They are designed for large mechanical loads and can be used for millions of switching operations. 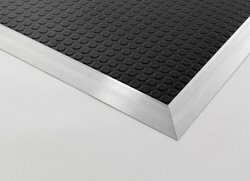 Depending on the requirements profile, our Safety Mats can be adapted to any surface area shape. They are available in various thicknesses and with various material properties such as slip-resistance and resistance against certain chemical substances. Click HERE to download information on SAFETY MATS in PDF format. Mayser Safety Edges are sensors which make pinching and shearing edges safe from the danger of pinching. 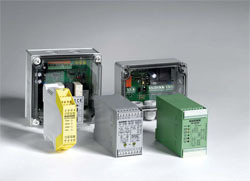 Depending on the switching principle, they are offered as a normally closed contact or a break contact. Safety Edges and Miniature Safety Edges are used for Drag Detection and Obstacle Detection in passenger cars, on bus and train doors, in the machine-building sector or on doors, gates and windows in building technology. If the Safety Edge meets with an obstacle, the automatic movement is stopped immediately. For example, if a hand gets caught in a closing door. Whatever you want to protect or safeguard with our Anti Pinch Sensor: we offer you the right technology and the right rubber profile. Mayser Safety Edges comply with the requirements of the ISO 13856-2 and ISO 13849 standards. Depending on the requirements, we produce Safety Edges with various bend radii, angled geometries and active ends. Our comprehensive range also includes higher protection classes (IP 67) or Safety Edges for use in potentially explosive atmospheres (ATEX). Using our DIY Safety Edge kits you can produce Safety Edges yourself, quickly and cost-effectively. Mayser Control Units analyse the output signals of our Safety Mats, Safety Edges and Safety Bumpers and immediately trigger the necessary safety measures. The functional monitoring of our evaluation units is carried out according to different principles. In the case of 2-wire technology, a constant closed-circuit current is measured by means of a monitoring resistor integrated in the sensor . If the sensor is activated, the voltage drops. The safety contacts of the Control Unit are opened and ensure safe shut-off of the drive. In the case of 4-wire technology, functional monitoring is carried out by returning the signals to the Control Unit. Our Control Units comply with categories 1, 2 or 3 as per EN ISO 13849 and are available in different models depending on the area of application.